I have been searching high and low for something to hang over my bathroom door to keep my hair dryer off the floor or out of the sink. I have been to The Container Store a zillion times to try and create what I was looking for with no luck. 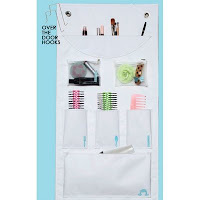 I thought I was going to give up until I found Kangaroom’s Over-The-Door Organizer. They actually had exactly what I was trying to find. I love it…and, I can finally use my sink again now that it is not full of brushes and combs!